August 18, 2016 0 comments on "Canning Dry Beans"
Did you know that it is possible to can dry beans? You can buy large quantities of dry beans very inexpensively and store them in five-gallon buckets. Beans are easy to store if you are interested in food storage. 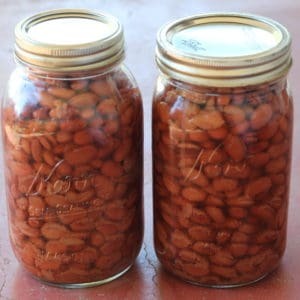 Storing dry beans in large containers is just one way of preserving them. If you can them, they are already cooked and ready to put into your favorite recipes, like chili or refried beans. You can use this recipe to can any type of beans, such as kidney beans, black beans, white beans, chick peas, pinto beans, etc. Two ingredients!? That’s right. This recipe takes a little time waiting for the beans to soak, but it is really easy to prepare, with only two ingredients! You can use quart or pint sized jars to can the beans. You will need to plan on approximately 3/4 c. dried beans for each quart sized jar, or a little more than 1/4 c. per pint sized jar. I always make a little extra, just in case. Sort through the beans and make sure there’s not anything in there that shouldn’t be in there. Place them in a large stock pot and cover with water. Let the pan sit overnight. By morning the beans will have soaked up all the liquid. Pour out any remaining liquid and put new water in the pan, covering the beans with 2 inches of water on top of the beans. Bring the beans to a boil, and simmer for 30 minutes. Stir frequently to prevent sticking. Ladle hot beans into sterilized canning jars, leaving 1 inch head space. Fill the jars with the cooking liquid, adding extra hot water if necessary, leaving 1 inch head space. Process in a pressure canner at 10 pounds of pressure for 75 minutes for pints or 90 minutes for quarts. Remove jars from canner and let them sit until completely cooled. Check to make sure jars are sealed. Place any unsealed jars in the refrigerator to use right away. Sealed jars can be stored in a cool, dark area for 1-2 years. New to pressure canning? Check out my step-by-step video based canning courses. Like this recipe? Try my recipes for canning chili, bean and ham soup, or for canning chick peas.